…[A]void the necessity of those overgrown Military establishments, which, under any form of Government, are inauspicious to liberty, and which are to be regarded as particularly hostile to Republican Liberty. Although it is by all accounts the most famous and best-known of Washington’s speeches, it was never actually delivered orally by Washington. It was first published in David C. Claypoole’s American Daily Advertiser (Philadelphia) on 19 September 1796 under the title “The Address of General Washington To The People of The United States on his declining of the Presidency of the United States.” It was almost immediately reprinted in newspapers across the country and later in a pamphlet form. 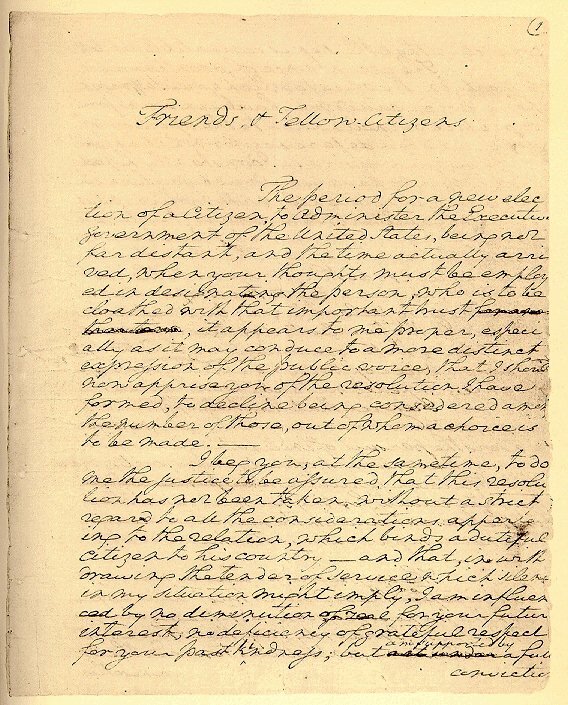 Page 1 of Washington's handwritten so-called Farewell Address (1796). Notwithstanding his role as the nation’s foremost military man, Washington consistently showed little enthusiasm for the idea of a standing army. He often reflected the perspective taken by Madison, Franklin, and others, who saw ample historical precedent for the deterioration of a republic into an authoritarian regime when a leader used threats from abroad as a means of augmenting his authority as a military leader and undermining the authority of the other departments. And as the above quote indicates, long before President Dwight Eisenhower warned the nation about the dangers of “an immense military establishment and a large arms industry” in the Farewell Address he delivered over 50 years ago, Americans were familiar with the threat of “overgrown military establishments” to liberty. In the early days of the United States, Americans, having just thrown off the yoke of the British empire, were understandably suspicious of standing armies in peacetime. The national army was kept intentionally small in peacetime, expanded in times of war, and reduced to prewar levels at the end of hostilities. That was the pattern followed through the end of World War I, a time when many were beginning to question why America had entered the war in the first place, thereby entangling the country in the political, economic, and ethnic rivalries of Europe. However, although America began to demobilize after World War II, there was no “return to normalcy” as President Harding had called for at the end of the previous war. The beginning of the Cold War with the Soviet Union, the fall of China to the communists, and the Korean War put America on a wartime footing that has become more or less permanent, whether we are in undeclared “shooting wars,” as in Korea, Vietnam, or our current wars in the Middle East, or in times of relative peace, most notably during the decade between the breakup of the Soviet Union and the terrorist attacks of September 11. Today America resembles a worldwide garrison state, with our 1.5 million military personnel scattered over more than 4,500 military sites in our own country and more than 700 bases in 130 foreign lands. (The number of bases may actually be higher, since the Pentagon does not count bases with a “Plant Replacement Value” of less than $10 million.) Add to that all the billions awarded in defense contracts each year and the large number of people employed in defense-related industries, and Washington’s and Eisenhower’s words, which may have seemed dramatic at the time, seem more like an understatement today. Between elections, members of the weapons industry sit in high places, bringing to the “councils of government” that “unwarranted influence” of which Eisenhower warned. Former Lockheed Martin Chief Operating Officer Peter Teets was appointed Under Secretary of the Air Force and Director of the National Reconnaissance Office during the Bush the Second’s administration. The Secretary of the Air Force was James Roche, a former vice president at Northrop Grumman. Secretary of the Navy Gordon England was vice president at General Dynamics. Deputy Secretary of State Richard Armitage had been a member of Raytheon’s board of directors and a consultant to Boeing. Senior Advisor to the President Karl Rove, who encouraged Republican candidates to support the Iraq War nine months before it started, owned between $100,000 and $250,000 worth of Boeing stock, according to his disclosure forms. By happy coincidence, Boeing has sold at least 40 commercial planes, worth nearly $4 billion, to Iraq since Saddam Hussein’s regime was toppled. There is no time in the nation’s history in which Washington’s and Eisenhower’s warning has sounded more clearly and powerfully than the present. Rodrigue Tremblay. “The five pillars of the U.S. military-industrial complex,” Online Journal. George F. Kennan in 1947, the year the X Article was published. On this date, the chairman of the Policy Planning Staff at the U.S. State Department, George F. Kennan, using the pseudonym “Mr. X,” published an article entitled “The Sources of Soviet Conduct” in the July edition of Foreign Affairs. The article focused on his call for a policy of containment toward the Soviet Union and established the foundation for much of America’s early Cold War foreign policy. The article was a polished version of a 5,500-word telegram Kennan had sent on 22 February 1946 to the State Department, when he was the U.S. chargé d’affaires in Moscow. Years later in his memoirs, Kennan mocked his “sermon,” saying he reread the telegram with “horrified amusement.” He also claimed that it sounded like “one of those primers put out by alarmed congressional committees or by the Daughters of the American Revolution.” But in 1946, when he wrote it, he believed every word. The telegram warned Washington that, “The USSR still lives in antagonistic ‘capitalist encirclement’ with which there can be no permanent peaceful coexistence.” Kennan went on to say, “we have a political force committed fanatically to the belief that with [the] U.S. there can be no permanent modus vivendi, that it is desirable and necessary that the internal harmony of our society be disrupted, our traditional way of life be destroyed, the international authority of our state be broken, if Soviet power is to be secure.” Kennan argued that the solution to dealing with the Soviets was to contain them. Just six months after the USSR and America had fought on the same side in World War II, the telegram contributed to the chilling of relations between the two countries and the onset of the Cold War. 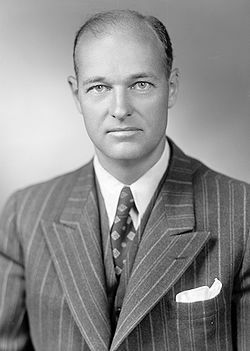 During the Eisenhower years, Kennan became an outspoken critic of Secretary of State John Foster Dulles’s policy towards the Soviet Union. He complained frequently that the U.S. had failed to take advantage of the liberalizing trend within the USSR following the death of the country’s longtime leader Joseph Stalin. And Kennan was also a prominent critic of U.S. involvement in the Vietnam War. Vietnam, he would say, “is not our business.” He argued that the escalation of the war made a negotiated settlement much less likely. On this date in Washington D.C., President of the United States (and former General of the Army) Dwight D. Eisenhower delivered his “The Chance for Peace” speech to the American Society of Newspaper Editors, which was also broadcast nationwide by radio. In his address, he contemplated a world permanently perched on the brink of war and he appealed to Americans to assess the consequences likely to ensue. There were two themes to this speech. Delivered in the wake of Joseph Stalin’s death, the speech offered the new Soviet leadership a five-point plan for ending the Cold War. As seen from the perspective of the U.S.S.R., Eisenhower was “demanding unconditional surrender.” The president’s peace plan quickly vanished without a trace. 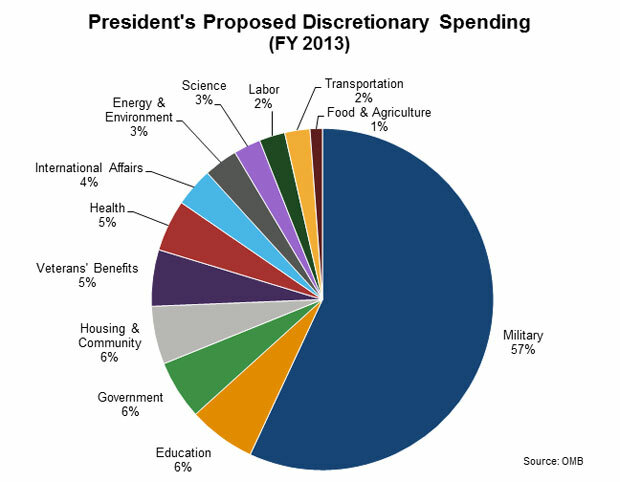 However, a second theme was woven into his speech and it is this: Spending on arms and armies is inherently undesirable. Even when seemingly necessary, it constitutes a misappropriation of scarce resources. By diverting social capital from productive to destructive purposes, war and the preparation for war deplete, rather than enhance, a nation’s strength. And while assertions of military necessity might camouflage the costs entailed, they can never negate them altogether. The cost of one modern heavy bomber is this: a modern brick school in more than 30 cities. It is two electric power plants, each serving a town of 60,000 population. It is two fine, fully equipped hospitals. This is not a way of life at all, in any true sense. Under the cloud of threatening war, it is humanity hanging from a cross of iron. These plain and cruel truths define the peril and point to the hope that comes with this spring of 1953 [emphasis added]. Unfortunately, despite Ike’s popularity and eloquence, Americans had no intention of choosing between guns and butter: they wanted both. The 1950s brought new bombers and new schools, fleets of warships and tracts of freshly built homes spilling into the suburbs. Pentagon budgets remained high throughout the Eisenhower era, averaging more than 50 percent of all federal spending and 10 percent of GDP, figures without precedent in the nation’s peacetime history. 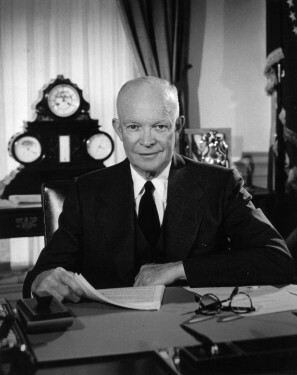 In 1952, when Ike was elected, the U.S. nuclear stockpile numbered some 1,000 warheads. By the time he passed the reins to John F. Kennedy in 1961, it consisted of more than 24,000 warheads, and it rapidly ascended later that decade to a peak of 31,000. The beneficiaries of military spending rationalized the arms buildup with — and vigorously promoted a belief in — the existence of looming national peril. Whether or not the threat was real, every ominous advance in Soviet capabilities was justification for opening the military-spending spigot wider. The discovery during the 1950s of a “bomber gap” and later a “missile gap,” for example, provided political ammunition to air-power advocates quick to charge that the nation’s very survival was at risk. That both “gaps” were fictitious was irrelevant. Ultimately, appropriations poured forth. Knowing at the time that the United States enjoyed an edge in bomber and missile capabilities, Eisenhower understood precisely who benefited from fear-mongering. Yet to sustain the illusion he was fully in command, Ike remained publicly silent about what went on behind the scenes. Only on the eve of his departure from office did he inform the nation as to what the federal government’s new obsession with national security had wrought. A half century after Eisenhower summoned us to shoulder the responsibilities of citizenship, we still refuse to do so. In Washington, an aura of never-ending crisis still prevails — and with it, military metaphysics. Ike is someone we should have listened to then and — with the U.S. today mired in perpetual war and flirting with insolvency and long term economic stagnation — we should listen to even more intently now. Andrew J. Bacevich. “The Tyranny of Defense Inc.,” The Atlantic Magazine (Jan/Feb 2011). Douglas Brinkley. “Eisenhower,” American Heritage Magazine 52 # 6 (September 2001). A vital element in keeping the peace is our military establishment. Our arms must be mighty, ready for instant action, so that no potential aggressor may be tempted to risk his own destruction. . . This conjunction of an immense military establishment and a large arms industry is new in the American experience. The total influence — economic, political, even spiritual — is felt in every city, every statehouse, every office of the federal government. We recognize the imperative need for this development. Yet we must not fail to comprehend its grave implications. Our toil, resources and livelihood are all involved; so is the very structure of our society. In the councils of government, we must guard against the acquisition of unwarranted influence, whether sought or unsought, by the military-industrial complex. The potential for the disastrous rise of misplaced power exists and will persist. We must never let the weight of this combination endanger our liberties or democratic processes. We should take nothing for granted. Only an alert and knowledgeable citizenry can compel the proper meshing of the huge industrial and military machinery of defense with our peaceful methods and goals so that security and liberty may prosper together [emphasis added]. 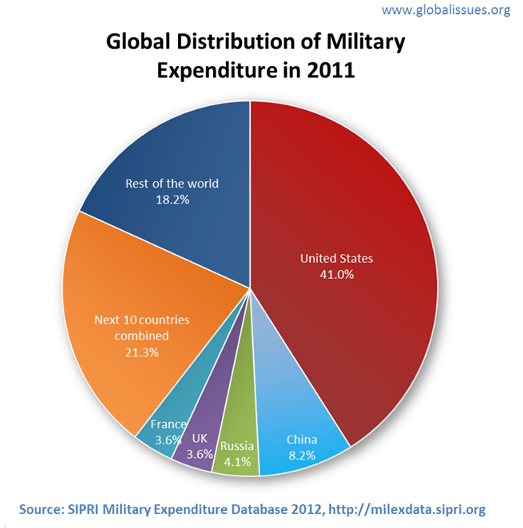 Perhaps the most stubborn misconception about the phrase “military-industrial” is that it began life with an attached third term that was excised prior to the speech’s delivery, usually either the word “congressional” or the word “scientific.” However, the historical evidence for both claims is essentially nil – there is no extant draft of the speech that contains any other version of the phrase except the one we know today. The Eisenhower Library has posted online a draft of the speech dated nearly a month before it was delivered, and the phrase military-industrial complex is intact, just as in every other draft. Moreover, a speechwriter staff memorandum dated 31 October 1960 — before the speech had even been drafted — referred to the “war based industrial complex,” very close to the phrase Eisenhower eventually said out loud. A few months ago, the son of Malcolm Moos, a journalist and academic who was a speechwriter for Eisenhower, came across among his deceased father’s papers a batch of folders marked “Farewell Address.” He sent the boxes off to the Eisenhower Library in Abilene, Texas. As archivists began to go through the papers, they discovered twenty-one previously unknown drafts, as well as memos and research materials that had long been missing from the record of one of the twentieth century’s most important speeches. Some historians have regarded the Farewell Address as an afterthought, hastily composed at the end of 1960 as an adjunct to the 1961 State of the Union. Others have regarded it as the soulful expression of an aging President who was determined to warn the American people of dangers ahead. But the Moos papers make clear that the address, far from being an afterthought, was among the most deliberate speeches of Eisenhower’s Presidency. Regarded in his day as inarticulate and detached, Eisenhower in these papers is fully engaged, grappling with the language of the text and the radical questions that it raised. Were the Soviet Union to sink tomorrow under the waters of the ocean, the American military-industrial complex would have to remain, substantially unchanged, until some other adversary could be invented. Anything else would be an unacceptable shock to the American economy. 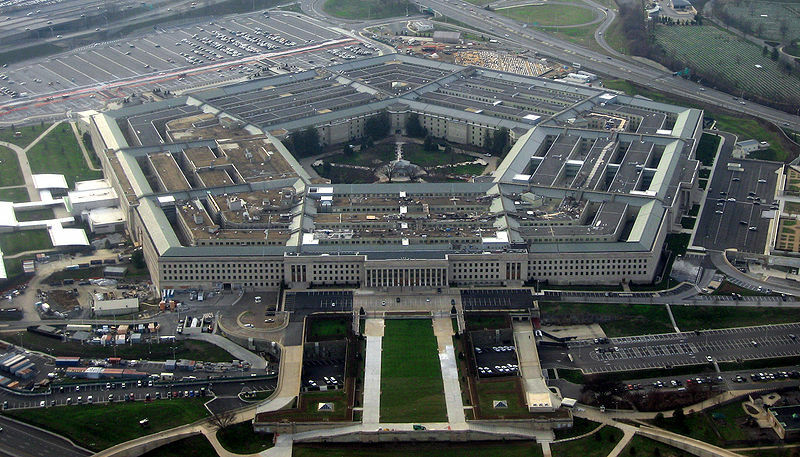 The Pentagon presently spends more in constant dollars than it did at any time during the Cold War – this despite the absence of anything remotely approximating what national security experts like to call a “peer competitor.” . . .
What are Americans getting for their money? Sadly, not much. . . . The chief lesson to emerge from the battlefields of the post-9/11 era is this: the Pentagon possesses next to no ability to translate “military supremacy” into meaningful victory. . . .
Institutional Self-Interest: . . . within Washington, the voices carrying weight in any national security “debate” all share a predisposition for sustaining very high levels of military spending for reasons having increasingly little to do with the well-being of the country. 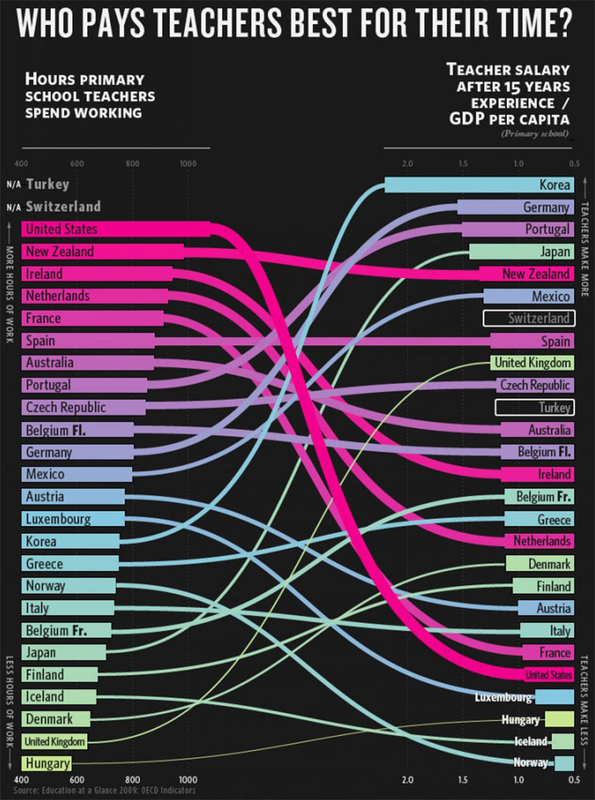 Strategic Inertia: In a 1948 State Department document [Memo PPS/23], diplomat George F. Kennan offered this observation: “We have about 50 percent of the world’s wealth, but only 6.3 percent of its population.” The challenge facing American policymakers, he continued, was “to devise a pattern of relationships that will permit us to maintain this disparity.” Here we have a description of American purposes that is far more candid than all of the rhetoric about promoting freedom and democracy, seeking world peace, or exercising global leadership. . . . 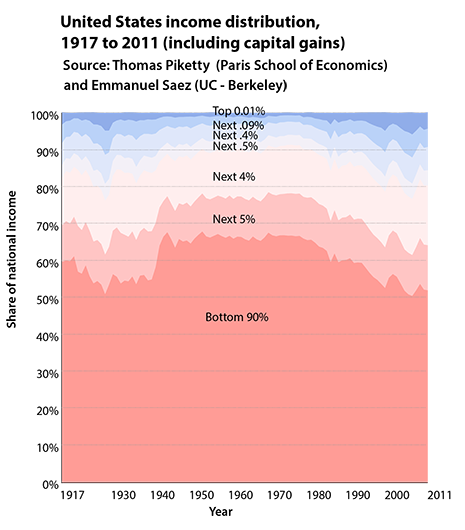 The effort [to maintain this disparity] has been a largely futile one. . . . Yet . . . the pre-existing strategic paradigm stubbornly persists; so, too, as if by default do the high levels of military spending that the strategy entails. Cultural Dissonance: The rise of the Tea Party movement should disabuse any American of the thought that the cleavages produced by the “culture wars” have healed. The cultural upheaval touched off by the 1960s and centered on Vietnam remains unfinished business in this country. . . . In effect, soldiers offer much-needed assurance that old-fashioned values still survive, even if confined to a small and unrepresentative segment of American society. . . .
Misremembered History: . . .American politics once nourished a lively anti-interventionist tradition. Leading proponents included luminaries such as George Washington and John Quincy Adams. That tradition found its basis not in principled pacifism, a position that has never attracted widespread support in this country, but in pragmatic realism. What happened to that realist tradition? Simply put, World War II killed it – or at least discredited it. In the intense and divisive debate that occurred in 1939-1941, the anti-interventionists lost, their cause thereafter tarred with the label “isolationism.” . . .
Like concentric security barriers arrayed around the Pentagon, these four factors – institutional self-interest, strategic inertia, cultural dissonance, and misremembered history – insulate the military budget from serious scrutiny. Andrew J. Bacevich. Washington Rules: America’s Path to Permanent War (New York, NY: Metropolitan Books – Henry Holt and Company, 2010). Memo by George Kennan, Head of the US State Department Policy Planning Staff. Written 28 February 1948, Declassified 17 June 1974. George Kennan, “Review of Current Trends, U.S. Foreign Policy,” Policy Planning Staff, PPS No. 23. Top Secret. Included in the U.S. Department of State, Foreign Relations of the United States, 1948, volume 1, part 2 (Washington DC Government Printing Office, 1976), 524-525. James Ledbetter. Unwarranted Influence: Dwight D. Eisenhower and the Military-Industrial Complex (New Haven, CT: Yale University Press, 2011). An ongoing theme at this site has been the corporatization of higher education. Commercial influence is nothing new in American higher education and has been with us at least since the Morill Land Grant Act of the 1860s brought agriculture and engineering to the university. As David Noble has demonstrated, the industrial revolution of the early twentieth century was an outcome of partnerships between campus and industry. However, one could argue that corporatization began to take off in the late 1950s and early 1960s with the onset of increased research spending — in an emerging climate President Eisenhower should have called “the military-industrial-educational complex.” Since then corporatization in higher education has increasingly gained the attention of scholars. So, exactly what are we talking about? What is corporatization? [T]he years between W.W.II and 1975 were characterized primarily by powerful government interventions in higher education that were a central component in what may be called the mid-century social contract [emphasis added]. 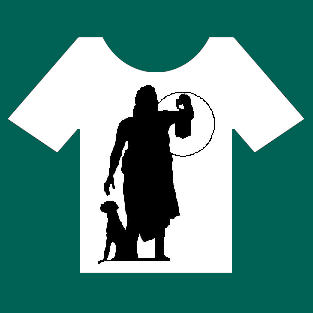 In this so-called “golden era” the university was part of and dedicated to the public good [emphasis added]. 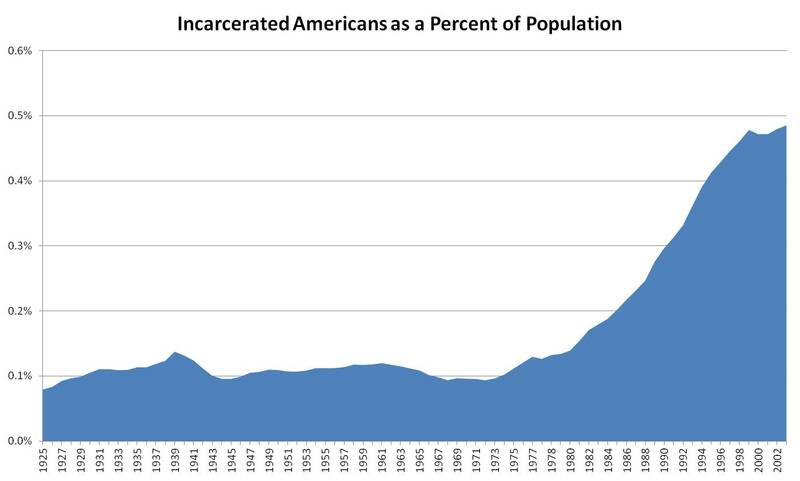 The change since 1975 is striking. Part-time faculty have grown four-times (103%) more than full-time (27%). The number of non-tenure-track faculty has increased by 92%, while the number of probationary (tenure-track) faculty has actually declined by 12%. Adjunct appointments went from 22% in 1970 to 32% in 1982, to 42% in 1993, to a current level of about 46 percent of all faculty [emphasis added]. The over-use and exploitation of contingent faculty is the linchpin of this process of corporatization, because it has fragmented the faculty and weakened our ability to act as a constituency. Tenured professors may well be in the best position to champion academic freedom for both full-timers and part-timers. After all, they are far less likely to lose their jobs for speaking out. Ken Jacobsen, a Democratic state senator from Seattle and a frequent advocate for part-time faculty members, has said that the reason the Teamsters struck United Parcel Service back in 1997 was because the full-timers felt the increasing use of part-timers would mean less work for them, since UPS could always choose to call in the lower-paid temporary workers. But since tenured professors are guaranteed a full-time workload year after year, Jacobsen says, they have not felt threatened by academe’s increased hiring of part-timers, and thus have looked the other way, feeling that the adjuncts’ plight does not affect them. Full-timers, Jacobsen said, have their piece of the pie, and their primary goal is to hang on to it, and to make sure that no one else takes it away. For faculty, corporatization means more authoritarian governance practices, not simply as reflected in handbooks but changes in the culture, as administrators get used to bossing around the majority of the faculty who have no hope of tenure or job security. 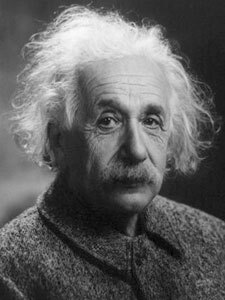 We need a better understanding, on the part of the public and the professoriate, of the mutual responsibilities of each. As Hamilton notes, “If, in a market economy, a profession does not renew the social compact through continuing education, [then] money and economic efficiency will eventually sweep the field to define all professional relationships as simply economic transactions between consumers and service providers for profit.” Practitioners must remind society, generation after generation, of the agreement’s purpose and demonstrate how the profession serves the common good.